1 Abbey House01263 715779work01603 870304fax Self-catering1 Abbey House, a spacious apartment within a country house, is situated near the coast in Binham in North Norfolk. In the summer, concerts are held at the site of an ancient priory in Binham which is a lovely quiet village. Wells, a coastal town with many attractive features including a steam train to the beach, is nearby as well as Blakeney which offers sailing and walks across the marshes. Exterior shot of this stunning building, Abbey House. 1 Abbey House offers weekly bookings starting on Saturday. 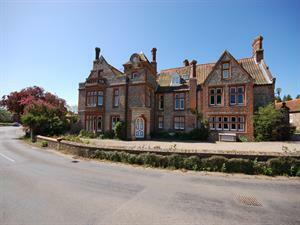 1 Abbey House, a spacious apartment within a country house, is situated near the coast in Binham in North Norfolk. In the summer, concerts are held at the site of an ancient priory in Binham which is a lovely quiet village. Wells, a coastal town with many attractive features including a steam train to the beach, is nearby as well as Blakeney which offers sailing and walks across the marshes.